This is from Playing the Archive. Iona Opie’s work has inspired generations. A family had a lot of fun making this figure. 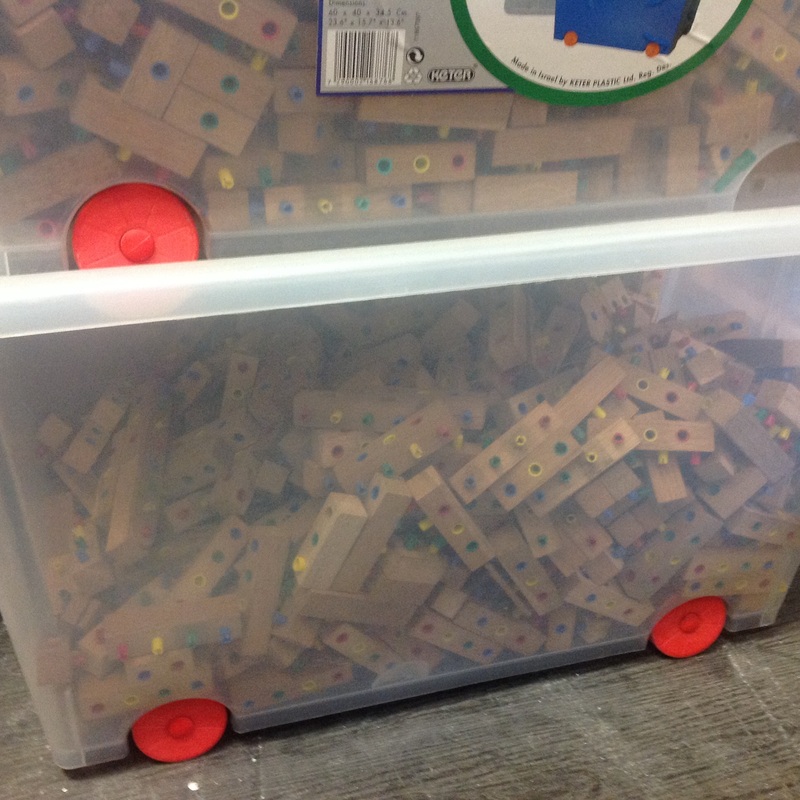 We had eight wheeled plastic containers to house the blocks. Having such a large amount available allowed for the ability to build a large structure. Some of the blocks in their original packaging were kept in the archives. 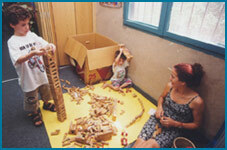 I have had on my mind how to describe our Heritage Centre of Play. Which aspects does it share with a Museum of Play, if at all? An established Museum of Play or of Toys and Games or of Childhood or such stuff should have no difficulty in arranging a pop-up display of toys of the last one hundred years. It covers the years from 1923 to 2011 and describes 100 toys and playthings which she claims to have been the most influential. She did not say “in U.S.A.” which she should have.The original toys are illustrated and are presented according to their year of production. I list here the toys that we could put on show. There are some originals though most are derivatives (meaning they are the outcome of the influence engendered by those originals) and many have been produced in Israel. Lots have been “previously loved”. I am very happy that in my lifetime 3D printers will become affordable and I shall be able to make toys and games together with my grandchildren in a corner of my kitchen. I have no garage. Maybe I should take over the small bedroom for this enterprise. We can look forward to molding sweets for parties and layering paper for board games and doll’s houses and making parts of construction sets and personalizing dolls and figures. Might I become the enemy of the workers of the Toy Industry? I do not think so. Chris Anderson is part of the Maker Culture, people who make things and communicate how. In Chapter Five of his latest book ‘’Makers” is the delightfully told story of how he helped his daughters solve their desire to refurnish their doll’s house. What miniature furniture that they could buy was in no way suitable because it was the wrong scale, flimsily made or vastly expensive. He preferred, remembering previous experience with his children, not to get out his woodworking tools. However, he had a 3D printer and a computer in the house. With a few clicks they chose plans for the furniture and after some sloshing of the 3D printer the two girls had the perfect doll’s house furniture. I do not think that a grandmother and her grandchildren making toys on her kitchen table shall pose a threat to an industry. What non-professionals can produce will be no competition for well made, cleverly contrived, colourful, interesting and fashionable manufactured toys. What it might lead to could be a decline in the toy market of the shoddy, the badly made and the potentially dangerous. Look seriously at the ramifications of our relationship with this machine once it shall be in our homes. Where shall the materials be stored? (Not in the kitchen. Just the names of the stuff sound toxic). Who will regulate the safety of the materials and the product? From where will we get the plans of the toys and games that we shall want to make? Should they be free of charge or should they be tied to proprietary rights and licenses? Shall toy companies chase after their protection rights and tempt children to conspire and scorn the law? Should not consent to the sharing of one’s ideas and not being coerced, respect and credit for another person’s innovations and efforts be in our creed? What will be the rights of the grandmother, or grandchild, who designs new toys and sends them downstream on the www river of the net? Shall they ever get remuneration or credit? Should all this be regulated? Will the market do its work if we stand back and do nothing? Our Expectations of Toy Manufacturers. May we envisage that toy manufacturers shall give plans together with the toys they are selling so that children can make bits and pieces for themselves to enhance their play? Should we not be encouraging manufacturers to do this? Not new questions. They have been asked, though not in my words, for the past few years. As yet there have been no answers that would help me. Ceilings should play their part in displaying toys. This is a hammock of Famous Bears that constituted a quiz during our Family Events one Summer. Who held up an airplane? One of these bears made a family miss the boat to Israel. Which one? One bear looks very sad. Which one? His owner left him behind in a hospital. Which is the oldest bear? The bear on the left was made to commemorate what event? How many bears remind you of Coco-Cola? Who was designed to make money? Which bear is the most travelled? What are Little Exhibitions Made of, Made of……? What happens to the stuff of play? Into clutter not known before. Be able to show What we know. Arranging play opportunities in public areas is a professional matter. The more the workers know about play and toys the better. 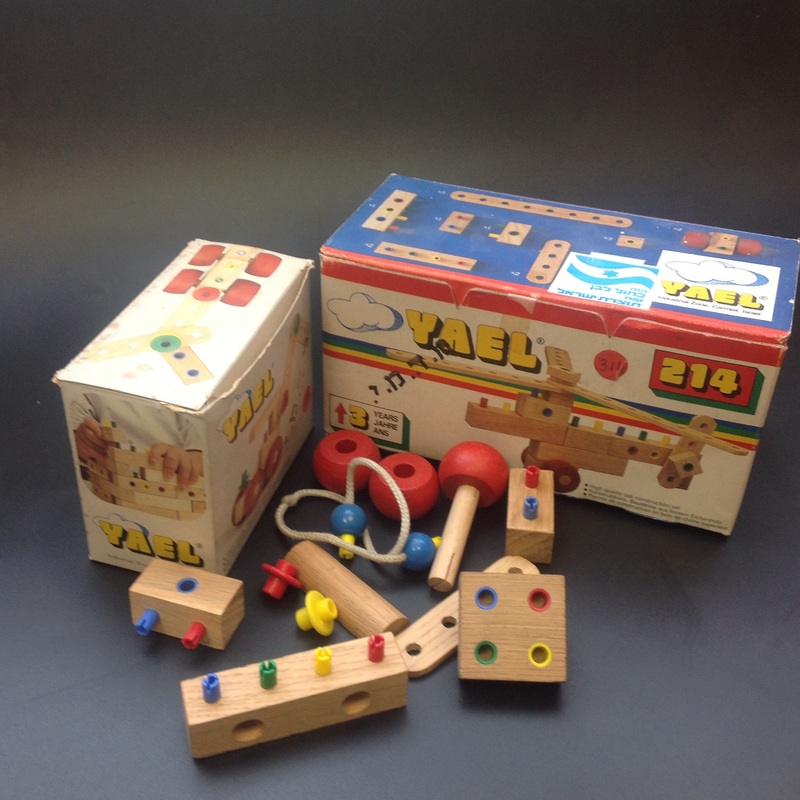 This is the program for the first course that was given at The Educational Center for Games in Israel to train teams of playworkers to facilitate play in the Centres for Elderly in Tel Aviv. With them we may Bequeath what was Unspoken. Is that the Nostalgia of Toy Collecting?